Also, be sure to check out our $1 Taco Tuesday and Happy Hour All Night Wednesday. Grenache or Garnacha is one of the most widely planted red wine grape varieties in the world. It ripens late, so it needs hot, dry conditions such as those found in Spain, where the grape most likely originated. It is also grown in Sardinia, the south of France, Australia, and California’s San Joaquin Valley. It is generally spicy, berry-flavored and soft on the palate and produces wine with a relatively high alcohol content, but it needs careful control of yields for best results. Characteristic flavor profiles on Grenache include red fruit flavors (raspberry and strawberry) with a subtle, white pepper spice note. Grenache wines are highly prone to oxidation with even young examples having the potential to show browning (or “bricking”) coloration that can be noticed around the rim when evaluating the wine at an angle in the glass. As Grenache ages the wines tend to take on more leather and tar flavors. 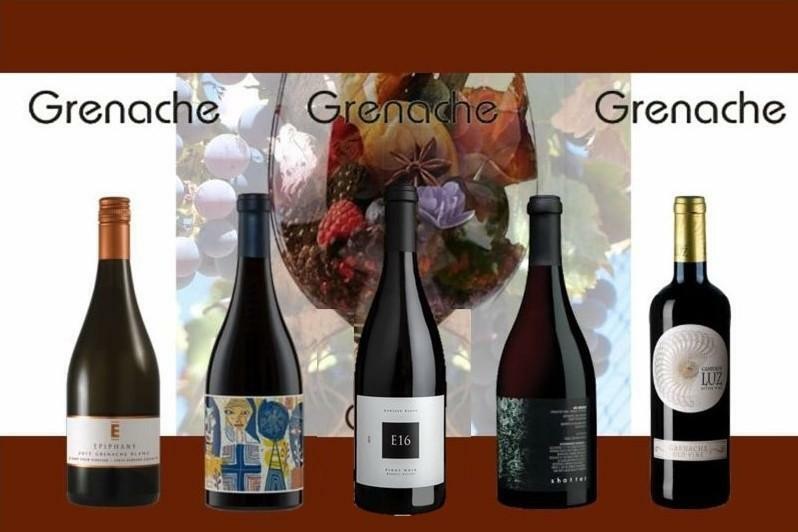 Wines made from Grenache tend to lack acid, tannin and color, and it is often blended with other varieties such as Syrah, Carignan, Tempranillo and Cinsaut, adding body and sweet fruitiness to a wine. In Spain, there are monovarietal wines made of Garnacha tinta (red Grenache), notably in the southern Aragon wine regions, but it is also used in blends, as in some Rioja wines with tempranillo. Grenache is the dominant variety in most Southern Rhône wines, especially in Châteauneuf-du-Pape where it is typically over 80% of the blend. In Australia, it is typically blended in “GSM” blends with Syrah and Mourvèdre with old vine examples in McLaren Vale. In Italy, the Sardinian D.O.C. wine Cannonau di Sardegna is by law 99% local Grenache (Cannonau). Grenache is also used to make rosé wines in France and Spain, notably those of the Tavel district in the Côtes du Rhône and those of the Navarra region. And the high sugar levels of Grenache have led to extensive use in fortified wines, including the red vins doux naturels of Roussillon such as Banyuls, and as the basis of most Australian fortified wine.